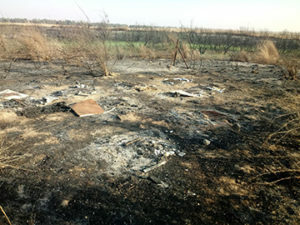 The charred remains of a honey farm in southern Israel due to incendiary kites from the Gaza Strip. Credit: Israeli Honey Council. Meidan added that “Hamas should know that not only does the arson not help them, it is not only hurting the Jews. It is bad for nature and killing bees – innocent insects that don’t deserve to die.” And he believes the people of the Sha’ar HaNegev Region are resilient. Ben-Aris said the first flowers that pop up as the land starts to recuperate are striking red anemones, which he said will ignite the fields in vibrant color. CAP: A beehive in flames from an incendiary kite at a honey farm in southern Israel near the Gaza Strip. Credit: Alon Sigron.